Today we have a them for "things i love thursday". Two different products - one brand. Method. First up - let's take a shower! Truth be told, this is a favorite of Andrew Henry's. Hold on to your horses ladies, my man cleans the shower. He also does our floors, windows, and makes our bed every morning (I despise making the bed). I know. I count my blessings every day. Wait, he doesn't cook. He HATES to cook. He doesn't even like to butter toast. You know I love to cook. I even quite enjoy buttering toast so this arrangement works well for us. Anyway, let's get back in the shower. AH sprays this stuff all over our tile after he finishes showering. It's non-toxic, smells pretty good and you can buy it at Target. AH goes through tons of it. He loves it. I think he gets a bit heavy handed with it, but I'm not complaining, he is cleaning the shower after all. To be fair, we have a big shower. Seriously. You could easily fit like 8 people in there. I have never tried to fit 8 people in there, nor do I feel I will ever need to fit 8 people in there, but I think I could if some weird and crazy circumstance called for it - like if we were playing a fun game of sardines with 6 other people. That has never happened you understand, I'm just saying it might, and we could. We even bathe Jake in there. It also came in very handy last year when I had a cast on my leg. AH put a garden chair in there for me, saved me. He's always saving me. That's another story. 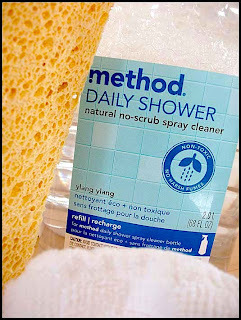 If you like "no-scrub" daily shower spray, this one is nice. That's what AH says anyway, and he's a pretty trustworthy guy. I have a feeling your shower is bigger than my bathroom. I'm not sure AH is real! Good to know, I hate the really chemical-y shower sprays, will have to check this one out! Henley, as family, I have seen this man with my own eyes, even hugged him a time or two and even I am not sure! Fairytale land over there in Phoenix! Who knew? Girl's, I'm telling you I feel like I live a fairy-tale life. Sometimes I think I will wake and find it's all been a dream. The shower is bigger than my bathroom. And he really is Prince Charming. who knew?! i love method for cleaning my kitchen so i assume i'll also enjoy it for my body. ha! HI Jeanette! Di d you happen to get your lamp yet? I just wanted to follow up. I'm going to give this product a try - thanks for the tip.